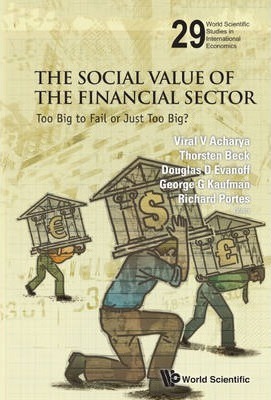 Social Value Of The Financial Sector, The: Too Big To Fail Or Just Too Big? As a result of the recent financial crisis, there has been significant public debate on the role of the financial sector in bringing about the "Great Depression." More generally, there has been debate about whether the current industry structure has enhanced social welfare or served a detrimental role.This book is a collection of papers presented at the conference held at the Federal Reserve Bank of Chicago, in November 2012 that examined the social value of the financial sector as currently structured. Issues evaluated include what are the perceived benefits and costs of the current financial system? How valuable have industry innovations been for society? Should regulation be used to "move" the industry in a direction thought to be more valuable for society? Should "big" banks be broken up? What are the welfare implications of the current industry structure? In the book, leading industry scholars debate these issues with a goal of influencing public policy toward the industry. Role Of Central Banks In Financial Stability, The: How Has It Changed? International Financial Crisis, The: Have The Rules Of Finance Changed? As a result of the recent financial crisis, there has been significant public debate on the role of the financial sector in bringing about the "Great Depression." More generally, there has been debate about whether the current industry structure has enhanced social welfare or served a detrimental role. This book is a collection of papers presented at the conference held at the Federal Reserve Bank of Chicago, in November 2012 that examined the social value of the financial sector as currently structured. Issues evaluated include what are the perceived benefits and costs of the current financial system? How valuable have industry innovations been for society? Should regulation be used to "move" the industry in a direction thought to be more valuable for society? Should "big" banks be broken up? What are the welfare implications of the current industry structure? In the book, leading industry scholars debate these issues with a goal of influencing public policy toward the industry. Description and Measurement of the Financial System; Social Benefits and Costs of the Current Financial System; Financial Industry Innovation; Effects of Regulation, the Safety Net and Other Government Guarantees; Finance and Economic Activity: Variations across Emerging and Developed Markets; Break Up the Big Banks? ; Where to from Here? What Does All of This Mean for Financial Regulatory Policy?.